Apex Legends Season 1: Wild Frontier is upon us all at last. This new Season was launched with a patch on 19th March, and brought with it the eagerly awaited Apex Legends Battle Pass; a brand new and powerful character in the form of Octane; and a host of balance changes, ability adjustments, and quality of life features. We’ll go through every little bit of it in our Apex Legends Season 1 guide, walking you through all you need to know about the Battle Pass and all the new changes Season 1 has wrought. This Season 1 guide is just one small part of our massive Apex Legends guides series, all of which you can peruse by heading to our Apex Legends tips/guide page. There you’ll find tonnes of tips and strategies for all skill levels, as well as links to other pages on everything from the various Apex Legends characters to all of the stats and spray patterns for different Apex Legends guns/weapons, and much more. 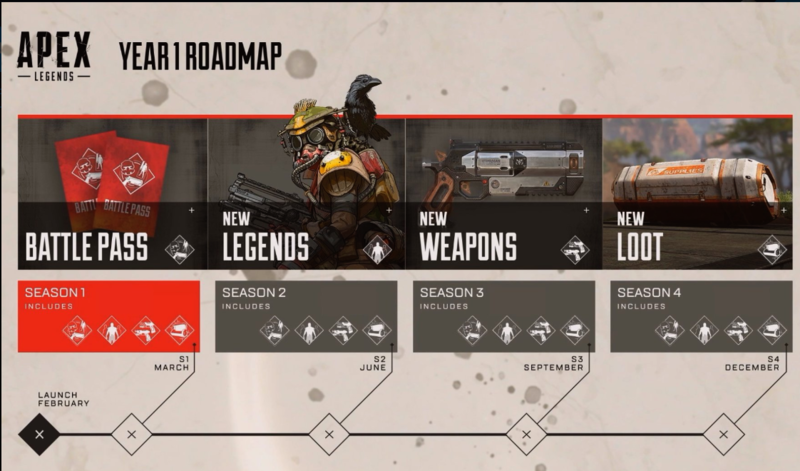 Below we’ll go over not just the release of Apex Legends Season 1 and its associated Battle Pass, but everything we know of the Apex Legends roadmap of things to come. Use the links below to skip ahead to any of these sections as you desire. You can now purchase the new Apex Legends Battle Pass for Season 1 from the main menu in-game, via the Battle Pass tab at the top of the screen. You can choose to buy either the Battle Pass on its own for 950 Apex Coins (requiring a purchase of 1000 Apex Coins from the store for £7.99/$10.57), or you can buy the Battle Pass bundle for 2,800 Apex Coins (requiring a purchase of £23.98/$31.73 worth of Coins), which unlocks the first 25 tiers of the Battle Pass with the purchase, giving you all those cosmetic rewards immediately. In order to unlock these cosmetics normally, all you really need to do is play the game and earn XP to increase your Battle Pass level (which incidentally is completely separate from your ordinary player level, so don’t worry about that). With each new Battle Pass level, you’ll unlock a new reward, all of which are listed below. You will also fully recoup the cost of the Battle Pass once you reach Battle Pass Level 97, according to the devs. This will allow you to purchase Season 2’s Battle Pass for free if you play enough during Season 1. Respawn have also added a feature where you can increase the amount of XP you earn by playing as a variety of different characters instead of sticking to just one, because, as they say, “we believe true mastery in Apex Legends means being a badass with anyone in any situation at any time”. This will hopefully also encourage more variety in terms of team composition over the course of Season 1, instead of just seeing the same old Wraith/Lifeline/Bangalore picks time after time. Some of these newly introduced cosmetics are free for everyone regardless of whether they buy the Battle Pass or not. In this respect it’s rather like Fortnite’s own Battle Pass; as you earn XP you unlock rewards regardless, but if you have the Battle Pass you’ll unlock much more of them, and more quickly. Below is a full table of all the rewards offered at each level of the Apex Legends Battle Pass. There’s a lot of them, so I’d strongly encourage you to use the search bar at the top of the table if you’re looking for one particular item. Besides the Battle Pass, the big new feature that has arrived with Season 1 is the ninth character we’ve all been waiting for: Octane, the High-Speed Daredevil. And hoo boy, he really lives up to his name. The fastest and most mobile Legend yet, Octane has the ability to trade Health for movement speed at a moment’s notice, leading to a very high-risk-high-reward style of play. We’ve been hard at work trying out this new character since Season 1’s release, and you can read all about what we’ve learnt in our Octane guide, which we’ve packed with practical tips and ability breakdowns. Season 1 is here, but, according to Respawn, that’s just the beginning of their vision for Apex Legends’ future. The roadmap above promises new Legends, new weapons, and new loot to arrive with each season and its associated Battle Pass. We’ve had a new Legend, but we’re yet to see new loot or new weapons arriving since the game’s release (besides the introduction of the Havoc Energy rifle). This means we’re likely to see future updates coming soon after the release of Season 1. It’s quite likely we’ll finally see the new L-Star EMG Light Machine Gun unveiled sometime soon, as well as the release of a tenth character, Wattson, coming soon after. Anywho, that should be enough to get you started with Apex Legends Season 1. I don’t know about you, but I for one am very excited to dive back in and learn more about the new character, Octane – though be warned, because if you have the same idea you’ll likely have to beat your teammates to the punch to play as him!